What is Raw and Why Go Raw? Glad you asked! Raw and living foods are about being unprocessed, unrefined, cold-pressed, and never heated above 44˚C (115˚F). This means that all the living enzymes in the food remain intact and that your body can easily digest and assimiliate every nutrient and deliver them to every cell in your body, giving you abundant energy, glowing health and a happy heart. Raw food groups consist of organic vegetables, fruits, dried fruits, nuts, seeds, gluten free grains, good fats, superfoods, fermented foods and drink, sea vegetables and sprouted grains and seeds. These ingredients allow you to go on to make the most amazing array of dishes, from dehydrated kale chips, superfood smoothies with almond milk and cacao, simple salads, cultured vegetables, nut cheeses, “pasta” dishes made from vegetables, or a “pizza” made from sprouted buckwheat or activated nuts & veges, home made “granola” to decadent desserts that are all gluten free, diary free, sugar free and taste divine! And you get to reap the benefits of having more energy and vitality, feeling nourished, healthy and well. One of the many benefits of a raw food diet is that it’s very alkaline. Our bodies natural state is to be alkaline. 7.3 on the Ph scale to be exact. Blood needs to be in a constant alkaline state to keep blood cells (you!) alive. A good percentage of nutrients are lost when we cook food or eat canned or pasteurised food. Plus our bodies have to work alot harder at digestion when food is cooked. This is because we have a finite number of our own enzymes, and natural depletion can cause disease later on. So it makes sense to borrow them from the plant kingdom instead! From the foods we eat to the lifestyle we live (stress, alcohol, toxins) can alter the Ph level. Most foods consumed on the Standard Australian Diet (SAD) are acid forming as is our lifestyle / daily stress in the modern world. Acidic environments within the body are anerobic, and welcome bad bacteria, parasites, disease and fungus to flourish in the body. Some symptoms of an acidic body are feeling sluggish, getting sick easily, weight gain, food intolerances, emotional instability, depression, and insomnia to name a few and to top it off, the body leeches minerals from your bones to help the blood maintain that precious alkaline state to keep blood cells alive. If unaddressed this can be the stepping stone to serious disease. An alkaline state, however is the opposite, our internal environment is oxygenated, keeping out the bad guys, every cell is functioning at 100% and humming with energy = health, energy and vitality. 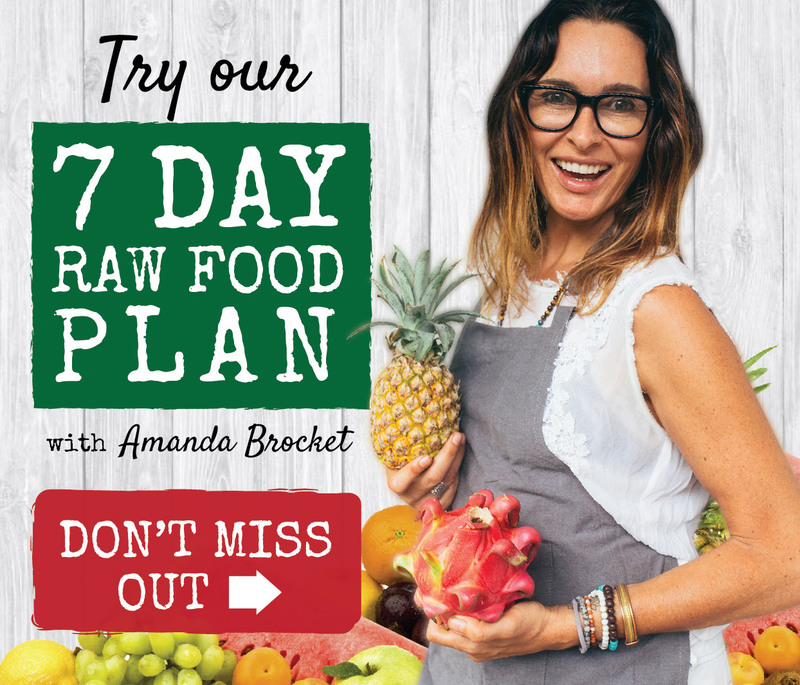 If you are ready to take the next step towards a healthier, happier you and would like to try a few raw food recipes that are easy to make and delicious and nutritious you can download my “Easy Raw Food Recipes to get you Started” ebook. Going raw can seem overwhelming at first as there is alot of information out there. In my “10 Steps for Raw Success“ ebook I simplify everything for you so to make the transition from cooked to raw as smooth as possible. If you are ready to delve deeper why not try our hugely popular 28 Day Rawsome Transformation Program? It is online so you can download straight away! You instantly get a Step By Step Program Guide that will take you from an ordinary diet into a supercharged, nutrient dense raw foods diet easily, a recipe book with over 60 raw and vegan recipes, a sample menu planner and weekly menu planner to make planning and making raw food easy, a done for you shopping list, bonus weekly inspirational videos, a guided meditation file, a daily journal, access to a private facebook group page and you get to ask a qualified naturopath questions for free! Plus loads more! Yes I want to find out more about the Program! Or browse the website – there are recipes, books, classes, free stuff and more on offer! Warning: Going raw may cause unleashing the shackles of food and body issues and cause energy, vitality health and wellness side effects! If you are interested in delicious raw food meal options check out our raw food recipes.